It was a sad day when The Bold Italic announced that it would no longer be publishing. The online site, based in San Francisco, was beloved by many in the city. 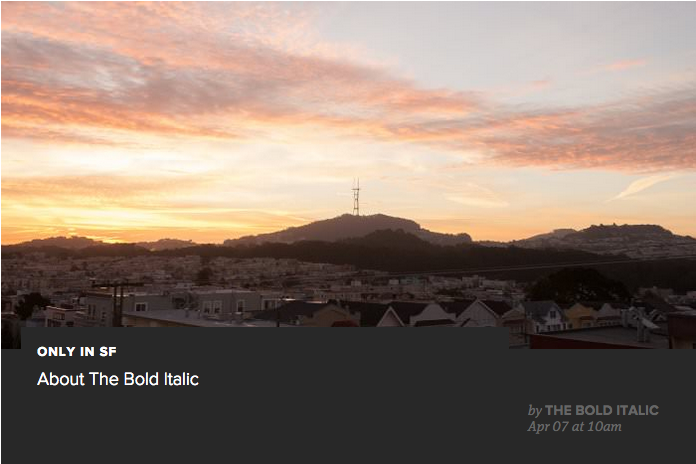 I started writing for The Bold Italic in October 2014. I loved every minute. I got to write about the best arcade bars in LA, LA-versions of SF restaurants, and putting Bentley to sleep, among many things. One of the last pieces I wrote was a personal essay about being a “fat” Asian. My first draft needed some work, and editor-in-chief Jennifer Maerz helped guide me to the actual published version, which was way better than the first with her feedback. As a freelance writer, I’ve worked for different publications. The Bold Italic was one of my favorites. Jennifer got back to me quickly. They paid on time. And most importantly, I got to write some really fun, interesting articles. I’m writing this from the Bay Area. While driving around, I noticed that most of the billboards here about tech companies (can anyone explain what New Relic is?!) and HempCon (can anyone explain who Baby Bash is?!). In LA, every billboard is movies, movies, TV, movies. I thought to myself, this would be a great Bold Italic story. Then, I remembered it was gone. Goodbye, Bold Italic. A little bit of San Francisco’s quirky sparkle is gone.